Risk Free 60 day money back guarantee. 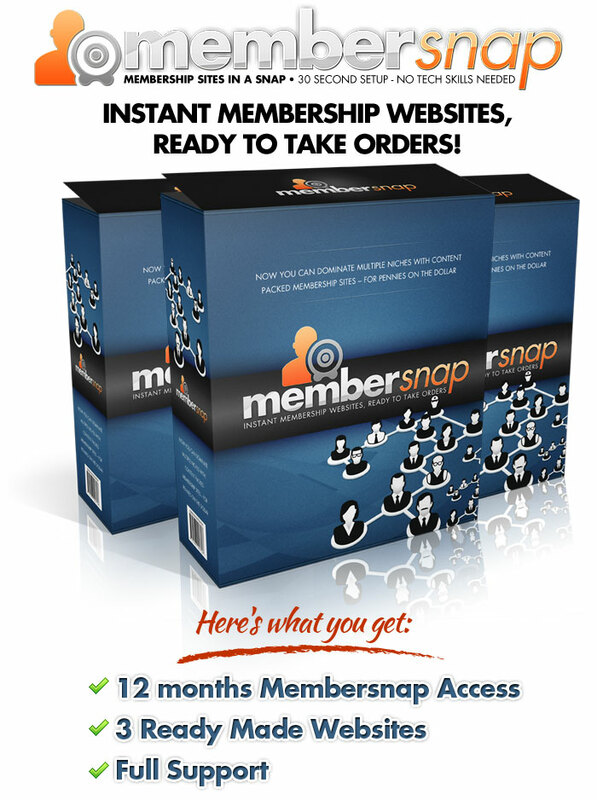 I am not a techy guy at all, so when I heard about member snap and how you can have membership site up in about a minute I had to check it out. All I had to do was sign up pick a domain name click a button or two and BAM: you have a full fledge membership site fully loaded with graphics, sales letter and everything and anything you need. It keeps track of all your members and all sales as well. It is very easy to use basically if you can click, copy and paste you can use member snap. I've even been able to sell the sites I created in MemberSnap. I've already flipped 15 site in just my first 3 weeks. I just love it! I like the idea of FINALLY setting up a Membership site that is pre-loaded with content and sites - being able to set up Membership levels, etc. And I don't have to figure out the HOW TO and pull my hair out. The VALUE is already there - just load, drive traffic and watch the checks come in! "Membersnap is the sense of community"
My favorite thing about Membersnap is the sense of community and knowing there's a great team who can help and I'm not alone. © 2012 Membersnap is a registered trademark of Crusher Productions LLC. All other marks are the property of their respective owners. All rights reserved. The results shown are not typical of our average user. This site and the products and services offered on this site and the products and services offered on this site are not associated, affiliated, endorsed, or sponsored by Google, Clickbank, eBay, Amazon, Yahoo or Bing nor have they been reviewed tested or certified by Google, Clickbank, Yahoo, eBay, Amazon, or Bing. ClickBank is a registered trademark of Keynetics Inc., a Delaware corporation. This site is not affiliated with Keynetics Inc. in any way, nor does Keynetics Inc. sponsor or approve any of this site's products. Keynetics Inc. expresses no opinion as to the correctness of any of the statements made by this website in the materials on this Web page. The typical purchaser does not make any money using this system. This website does not guarantee income or success, and examples shown in this presentation do not represent an indication of future success or earnings. The company declares the information shared is true and accurate.